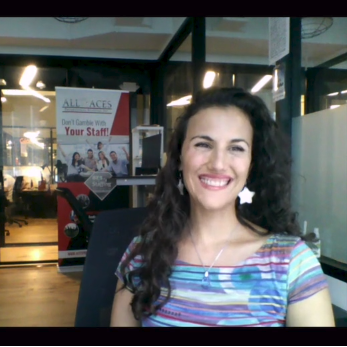 All Aces Promotional Staffing has added something new to our company culture: for the past six months, we’ve been getting together twice a week to practice yoga over Skype. For 15 minutes we put our phones aside and replace business with breathwork, stress with stretching, and enjoy guided meditations that lead to deep relaxation. Our yoga teacher admits to getting something out of it too……she happens to also be our client relations manager!A transformation is happening; we are relaxing and recharging our batteries, but instead of escaping the office to take a yoga class, we’re supporting each other in taking this time to relax and infuse our workday with peace and presence. Yoga with your coworkers means never having to worry that you’ll get in trouble for taking the time off! 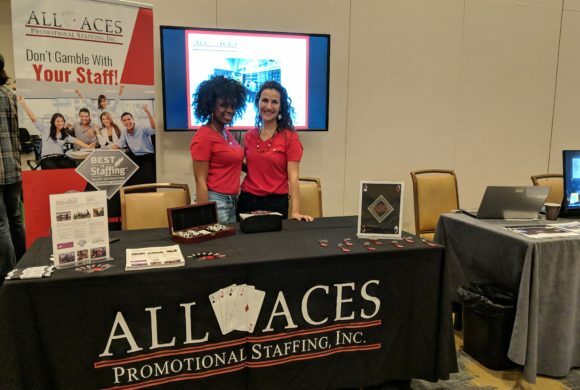 This is not only a great asset to our work culture, but it’s especially helpful to us during the event and experiential marketing industry’s busiest season, which is summer and fall – otherwise known as now! We also have flexible scheduling with remote Fridays and additional days as needed to account for those busy weekends! Do gift yourself the after work treat of a digital detox. Get off your computer/phone/tablet when the work day is done. Aim for meeting people in person and try to avoid too much texting or social media. Turn your phone off at night and get that old alarm o’clock out of the basement, the one you haven’t touched since 2005. This will promote better sleep and reduces exposure to electromagnetic radiation and other harmful effects of sleeping that make a bedside smart phone not such a smart idea. Minimize work on the weekend. Take the weekend off, unless you’re working an event or have a special weekend project. If you normally work weekends, take a day off during the week to compensate. It’s easy to tell yourself that being a workaholic will get the job done, but it won’t be a very good one if you’re exhausted, overwhelmed and borderline irritable. If you absolutely must get work done on the weekend, block off one small chunk of time on either Saturday or Sunday, and make sure you draw the line there. Do exercise as close to daily as possible. Most healthcare professionals not only recommend staying in shape, but all seem to promote the a 30-minute express routine which can easily fit into your day. A trip to the gym doesn’t have to be a two-hour expedition that begins at 6am and cuts into early morning work tasks. A quick, relatively intense workout as tailored to your body’s needs and goals is perfectly fine. Despite what we said above, go to a yoga class outside the office! But you get extra credit for bringing a coworker….think of that one person who needs to relax the most, and drag them to class. Do stick with your current templates and database systems. Reinventing the wheel is something you love to do – especially if you’re an entrepreneur. The cutting edge of technology is constantly shifting, and you want to improve along with it. However, this type of researching and company restructuring is great for the off season when you have a little more time on your hands, not just to learn new systems and train your team, but to have them fully in place for the following busy season. If something new has a negative impact on your business, wouldn’t you rather find out when things are slower and there’s less money on the table? Don’t ignore your personal life. Continue to nurture your personal relationships with family, friends and/or your spouse or partner. Your industry’s busy season reveals how intense work life can get – the people in your life are proof that you have a support system during these stressful times. For example, let’s say it’s 8:30pm and you’re anticipating an email that you won’t be able to take any action on till the next day. You are at the dinner table with your family – thinking and obsessing about the situation is not only a waste of energy but will take you away from the present moment. Do you want to be sitting at your desk the next morning wishing you’d been more attentive at dinner the night before, knowing that your worrying was for nothing? It’s not a happy place, and will probably leave you feeling as though work is more stressful than it actually is. Much of the time, we’re the ones making our own lives more stressful and complicated.